Africa’s tremendous economic growth, political reforms and social changes have intensified the need for a strong fourth estate. Amid these developments, journalists play a vital role. They hold the powerful accountable. They engage the public in debates around critical issues. At their best, journalists build a better, more equitable society. High-quality professional training is one of the best ways to bolster African journalism now and in the future. This FAQ explores our project goals. For more about the genesis of the project, see the summary of our eLearning Africa 2015 presentation. What is Africa Talks E-Learning? 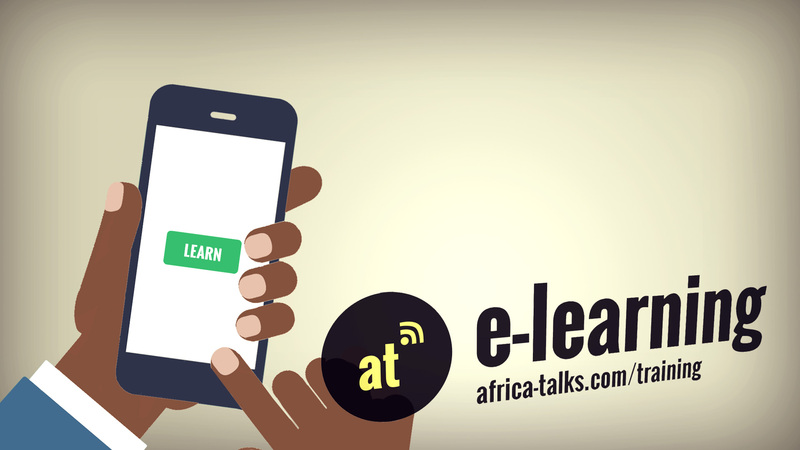 Africa Talks E-Learning is a new online training project built by and for African journalists. Our goal is to create a library of high-quality original training materials. We will deliver this content via a custom technical platform. The courses will reflect the real-world conditions in which African journalists work. The platform will prioritize access, regardless of connection speed or device. Why deliver this training online? Physical training institutes are well-equipped to reach local or even regional audiences, but distance education is the best way to help the largest number of journalists. An e-learning platform can assist journalists in newsrooms across the continent and provide an up-to-date, consistent curriculum. What role do journalism schools have to play? African journalism schools have an important role to play in preparing future journalists for the critical work they will undertake. However, ongoing professional development can significantly enhance the quality of journalism, especially in a climate of rapid technological change. Digital innovations have irrevocably affected how journalism is practiced and paid for, and the skills and standards young journalists learn in school will invariably shift as they progress in their careers. When will the training be ready? We will launch the project by early 2016. There is a lot to do in terms of preparing both the content and the technical platform, and we want to make sure everything is right. But we also plan to develop the project in stages and get input from journalists throughout the process. Including journalists on the ground and from African institutions will be key to our success. Do African journalists really need training? We believe they do. But we would hasten to add the same is true for American journalists, South African journalists, Chinese journalists or journalists anywhere else. Training is important because journalism is a challenging, hands-on process that’s learned through trial and error. Communicating clearly, concisely and precisely about complex topics demands a range of disparate skills. At the same time, journalism is changing. The digital abilities that were sufficient just a few years ago are being replaced as technology advances. Keeping up with new technologies is an opportunity to inform more people, and journalists should be leaders in this global change. This growth mindset is important not just for those who seek training but also those who deliver it. Our project will emphasize the value of the experiences, perspectives and solutions our trainees bring to the table. Journalists in Africa face challenges beyond what skills-based training can address. Lack of organizational support, restrictions on press freedom and concerns for safety have a big impact on how African journalists do their jobs. In some cases, these conditions create unfair circumstances for local African reporters. They also affect the quality of the journalism produced. Journalists everywhere — in Africa and beyond — need to be compensated fairly, and their work needs to be valued appropriately. Training is a one important way to cultivate this value. Done right, training can benefit not just the individuals who participate in it but the profession as a whole. What makes “African journalism” different? Core skills and values unite journalists in their work, wherever they might be. African journalists are, above all, journalists. But they also face a unique mix of challenges and responsibilities. Some of these factors are consistent across the continent. Others vary by country or region. Differences in press freedom, language, communication infrastructure and much more shape the the day-to-day realities of African journalists. To succeed, we believe our project must reflect what journalists face on the ground. What role will African journalists play in designing the training? Training designed from afar can help, but it often lacks the practical ingredients needed to be of immediate value. TO address this, we hope to involve African reporters, editors, producers and researchers in every part of our project. This includes determining what training topics to cover, providing case studies and local examples, and defining the goals of the training. This is why we’ve developed a survey to get input from journalists in Africa on their training interests and needs. We invite you to add your thoughts, and we hope you’ll consider sharing this with colleagues. It’s available in English (https://www.surveymonkey.com/r/at-elearning) and French (https://fr.surveymonkey.com/r/MNKCXHJ). The survey’s just the first step. More important is the ongoing conversation we hope we can participate in. Our goal is to keep the training materials free or very low cost. We may offer training for free and charge for other aspects of the project. It’s very important to us that the training we develop is accessible to as many journalists as possible. We also want to find ways to sustain and expand our efforts so we can broaden our impact. Can journalists who contribute content or teaching to the project participate for free? We will find ways to compensate journalists who provide content, teaching or other expertise to our project. We are exploring these options now, and they may take the form of stipends, access to training materials, or other types of compensation.